Toyota Yaris is one of the latest entrants in the mid-size executive sedans segment. Being a latecomer in the segment, it comes with a lot of safety features. Hyundai Verna, Maruti Ciaz, Honda City, Nissan Sunny, Skoda Rapid and Volkswagen Vento are its competitors. In this article, we compare the prices of these cars. Simple and elegant. That’s what defines Toyota Yaris completely. Toyota’s latest launch is a mid-size executive sedan. Toyota, yet again lives up to its classy and premium looks cars. However, the sedan made a late entry in the mid-size executive sedan market in India. The latest offering by Toyota faces a very tough competition in its segment. Yaris is only available in petrol variant which might be another disadvantage. However, the sedan is offering a good number of safety features, giving out the edge over its competitors. Most of the features that Yaris provides, is available in none of its competitors and is usually found in a premium car. Yaris is the perfect buy for a person who prefers comfort and safety over the looks, as the car looks very bulky on the outside. 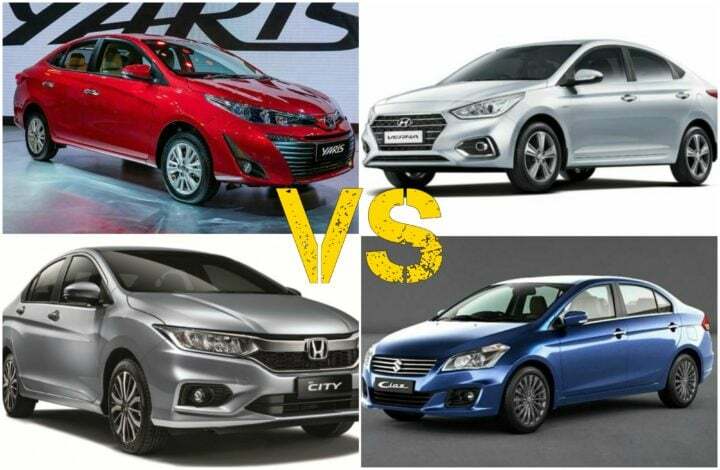 In this article, we have pitched Toyota Yaris against Maruti Suzuki Ciaz, Hyundai Verna, Honda City, Volkswagen Vento, Skoda Rapid and Nissan Sunny. 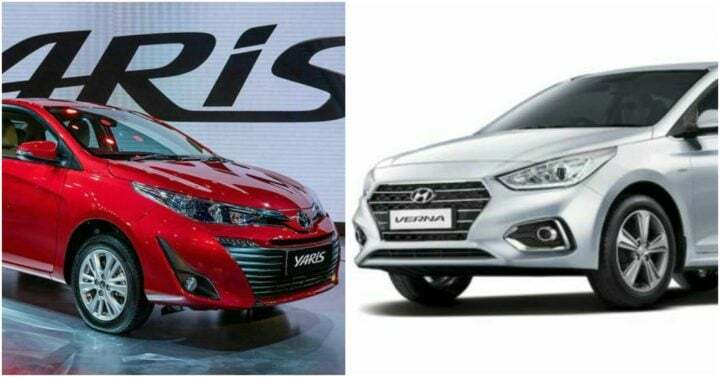 We will compare each variant of Yaris with different variants of the competing car in terms of price. Yaris is available in four variants – J, G, V and VX – with manual and CVT options across all variants. The base variant of Yaris starts from Rs 8.75 Lakhs and goes up to Rs 14.07 Lakh for the top end variant. Verna is available in four variants – E, EX, SX and SX(O) – with manual and Automatic transmission options in two variants. The base variant of Verna starts from Rs 7.8 Lakh and goes up to Rs 12.56 Lakh for the top end variant. Ciaz is available in four variants – Sigma, Delta, Zeta and Alpha. Out of the four variants, only Delta, Zeta and Alpha get Automatic Transmission options. The base variant of Ciaz starts from Rs 7.83 Lakhs to Rs 10.63 Lakhs for the top end variant. Yaris is available in four variants – J, G, V and VX – with manual and CVT options across all variants. The base variant of Yaris starts from Rs 8.75 Lakhs to Rs 14.07 Lakh for the top end variant. Honda City is available in five variants – S, SV, V, VX and ZX – out of which ZX comes only with a CVT transmission. Also, the V, VX and ZX are the only variants that get an optional CVT. The base variant of City starts from Rs 8.71 Lakh to Rs 13. 70 Lakh for the top end variant. Vento comes in six variants – Trendline, Highline, Comfortline, Highline Plus, Highline Plus 16″ Alloys and Sports TSI. All the variants barring Trendline get an Automatic transmission. The base variant of Vento starts from Rs 8.19 Lakh to Rs 12.87 Lakh for the top end variant. Sunny is available in three variants – XE, XL and XV. Out of the three variants, XC comes only with CVT. The base variant of Sunny starts from Rs 6.99 Lakhs to Rs 9.44 Lakh for the top variant. Skoda Rapid is available in four variants – Active, Ambition, Style and Edition. Except Active, all of the variants get an optional Automatic Transmission too. The base variant of Rapid starts from Rs 8.32 Lakh to Rs 12.21 Lakh for the top end variant.